Panel, 55 x 38 (from literature below; Franklin, 1994, 80–81, states that the panel has apparently been enlarged). 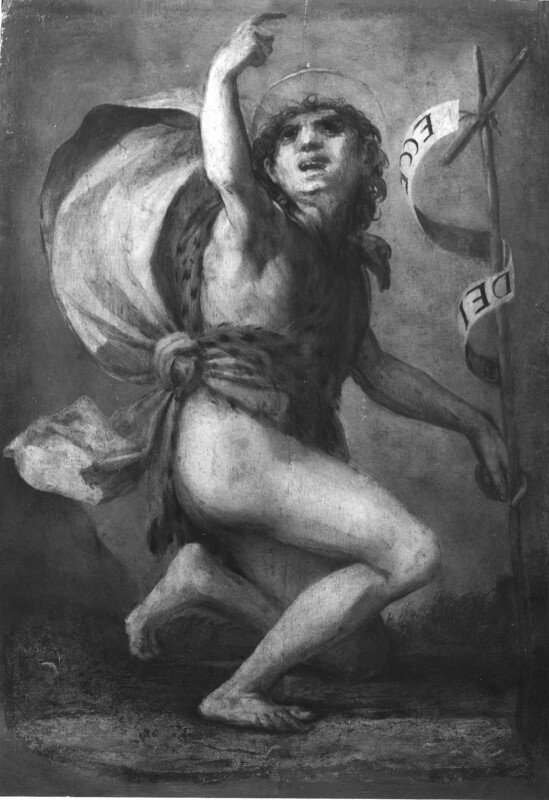 Inscribed on the banderole attached to the saint’s cross and seen in reverse: ECCE… DEI (the middle word AGNUS may be seen through the back of the turning banderole). There is a crack down the center of the panel. The left hand of the saint seems in poor condition. Otherwise the picture seems to be in good condition. It is very thinly executed so that much of the underdrawing on the ground of the panel comes through the paint. It has recently been cleaned revealing a patch of water at the lower left that was not apparent before. The saint wears a tan fur garment with brown spots; his cloak is red purple in the shadows, becoming pink-rose-red and then a lighter value of the same in the highlights. Brown hair, somewhat reddish at the top and at the left. Ruddy flesh, brownish in the shadows, pinkish in the hands, feet, knees, cheeks, and lips. Black eyelashes. Blue eyes. The rim of the halo is yellow and then transparent yellow from the rim to the head with the greenish background showing through. Otherwise the background is gray blue. Dark green grass and brown cast shadows. There is a patch of blue water at the lower left. PROVENANCE: Acquired in Florence in the 1960s. See L.14D on a painting of the same subject by Rosso mentioned in an inventory of 1588 of the possessions of Don Antonio de’Medici in Florence. Carlo Del Bravo, “Un dipinto manieristico,” Festschrift Ulrich Middeldorf, edited by Antje Kosengarten and Peter Tigler, 2 vols., Berlin, 1968, I, 281–282, II, PL. CXXXI, attributes the picture to Rosso on the basis of its similarity to the S. Maria Nuova altarpiece and the Volterra Deposition. Luciano Berti, in Primato del disegno, 1980, 191, no. 451, and Fig., as Rosso. Wilmes, 1985, 94, 108–110, 136, 138, Fig.10, as done between 1518 and 1521, and as showing the influence of Michelangelo. Carroll, 1987, 34, n. 43. 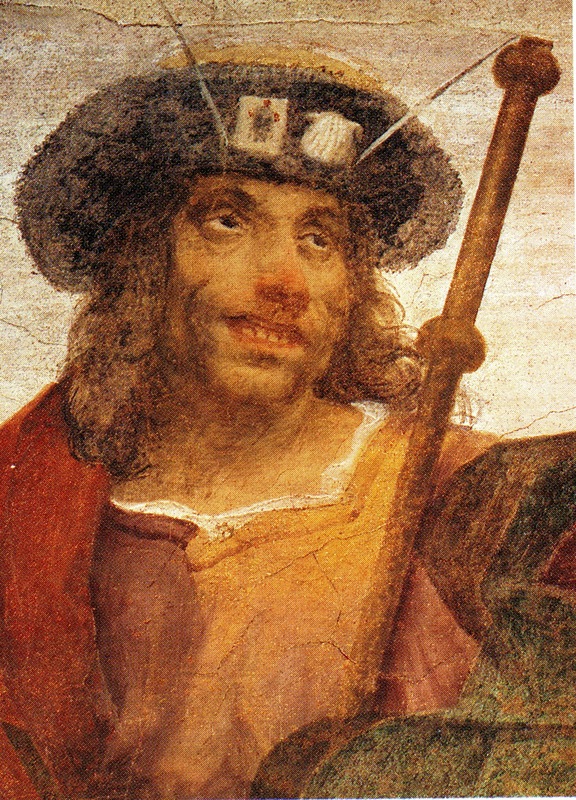 Ciardi and Mugnaini, 1991, 14–15, 21, 58–59, no.7, with Color Pl., (backwards), 60, as Rosso, between 1518 and 1521, and as related to Donatello. Franklin, 1994, 73–74, 80–83, 278. n. 91, Color Pl. 59 (backwards), as datable around 1520, but a date as late as 1522 should not be rejected, the subject a common one in Florence (see 278, n. 89), but the saint unusually young, his pose in reverse of Eve’s in Michelangelo’s Fall of Man on the Sistine Ceiling, and as showing the saint crying out in the wilderness, as in Matthew 3:3, Mark 1:3, and John 1:23. Costamagna, 1994, 147, n. 2, under Cat. 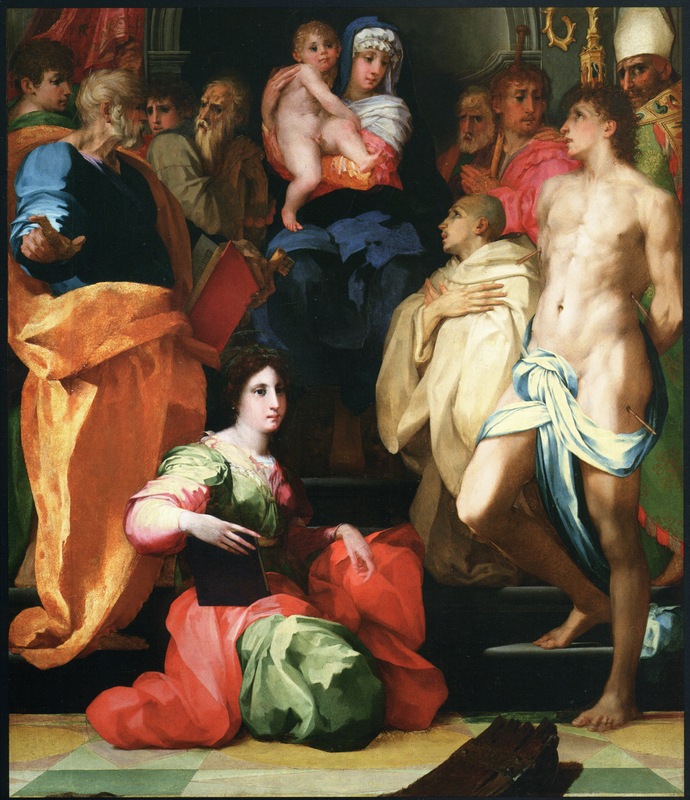 31, as done in 1519–1520 at the same time as Pontormo’s St. Anthony Abbot in the Uffizi. Mugnaini, 1994, 101, mentioned with the Volterra Deposition as esasperate composizioni di azioni concitate e di personaggi spiritati. 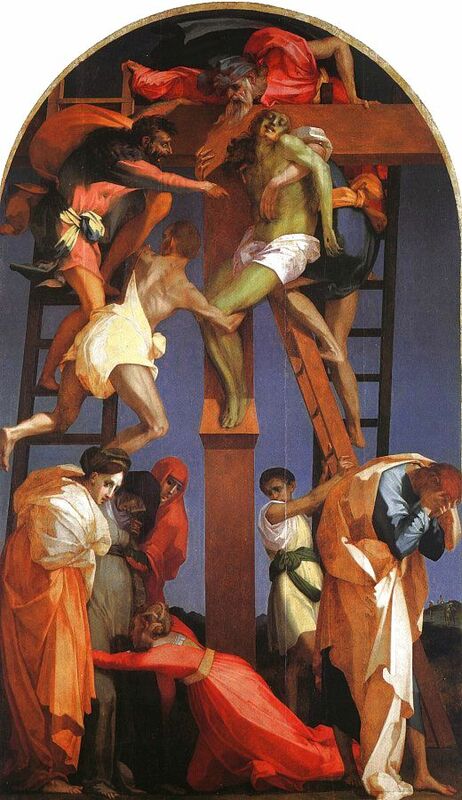 Ciardi, 1994, 40, Fig., 41, 52, as influenced by the figures in Donatallo’s St. Lorenzo Crucifixion and as related to the Doni tondo. Mugnaini, in Empoli e Volterra, 1996 (1994), 130–131, 288, Fig., following a lengthy review of the spiritual literature of the early sixteenth century in Florence and its expression of religious fervor following the death of Savonarola “esposto alla rovente suggestione del suo sacraficio,” from the return of evangelic simplicity (“Rusticitas”) to santa pazzia, including a letter of 18 December 1513 by Machiavelli on a sermon by the Franciscan friar Francesco di Montepulciano “hier mattina”, and the conjecture that Savonarola may have met the nineteen year old Rosso at San Marco during his very probable apprenticeship with Fra Bartolommeo, Mugnaini writes of Rosso’s St. John the Baptist in terms of that santa pazzia and l’espressione di una santa animalità…a slanciarsi verso le altezze della divinitias. 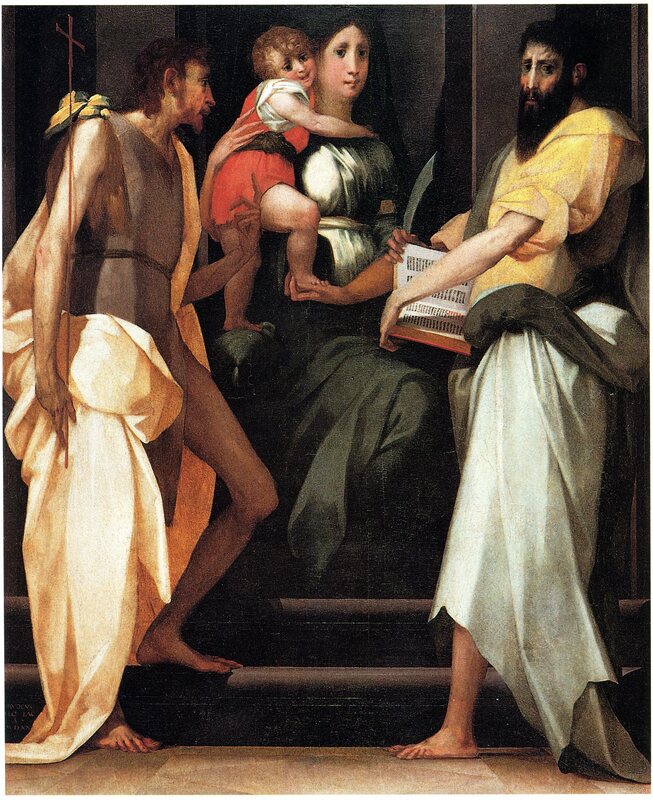 The characterization of the saint is of the kind of St. James in the Assumption of 1513–1514 (Fig.P.3c), of St. John the Baptist and St. Jerome in the S. Maria Nuova Altarpiece of 1518 (Fig.P.5a), of all the figures, but especially those at the top, of the Volterra Deposition of 1521 (Fig.P.9a), and of the saints and the Christ Child in the altarpiece from Villamagna of the same year (Fig.P.10a). St. John’s head, turned back away from the viewer, is very similar to Christ’s in the Deposition. The execution of the figure is very close to that of the figures in that altarpiece: similar kinds of quick strokes and a comparable thinness of the paint through which the underdrawing can be seen. But the St. John the Baptist does not have the broad planarity of the altarpieces of 1521, or even that of the S. Maria Nuova Altarpiece. 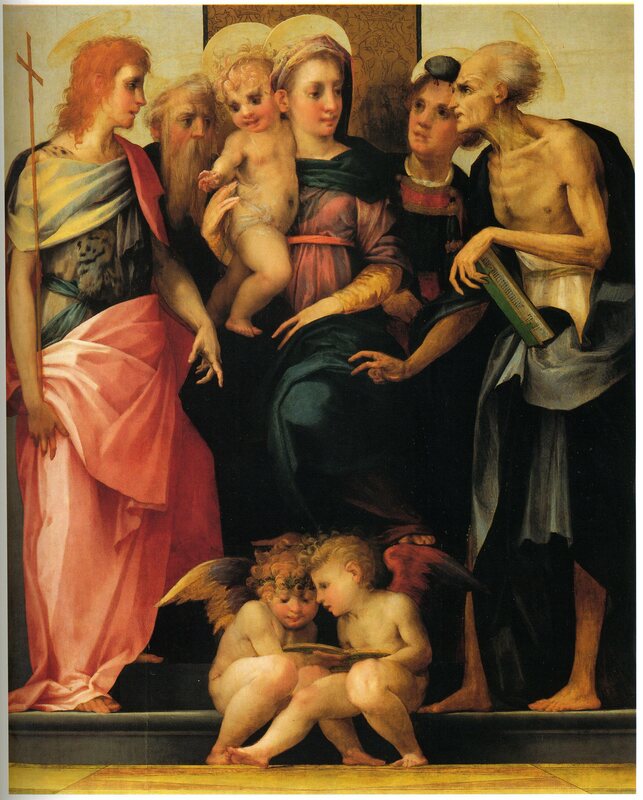 Instead there is a degree of roughness, even a certain dryness, that suggests the details of the Dei Altarpiece of 1522 (Fig.P.12a), especially of the four saints at the left and the three behind St. Sebastian. 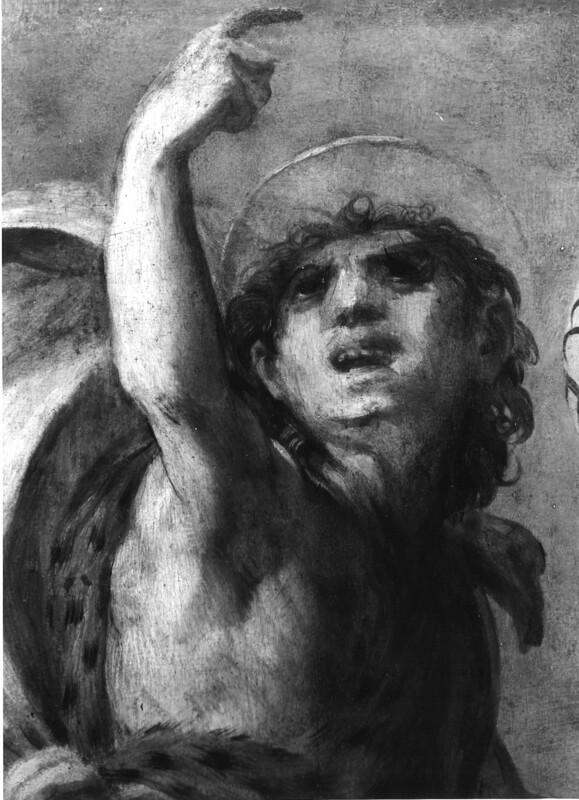 The strong foreshortening of St. John’s right arm might be compared with the drawing of St. Peter’s left arm in the altarpiece of 1522. There is also a slight turning of the forms one into the other in the St. John the Baptist that suggests the compositional relationship of the Virgin and the Child in that altarpiece. But as the style of the small picture cannot be completely separated from that of the pictures of 1521 it seems reasonable to date it 1521–1522. 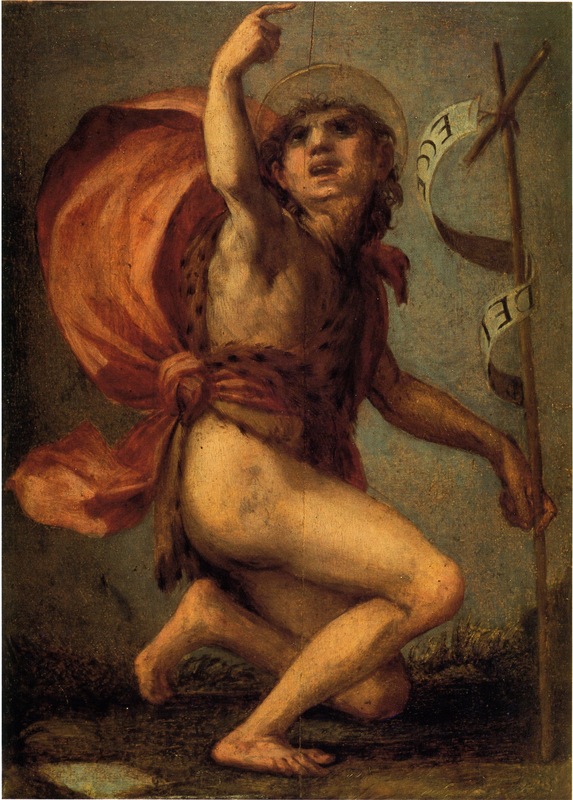 Stylistically it is almost identical to Rosso’s Virtù Vanquishing Fortune, in Darmstadt, also datable in 1521–1522 (D.6). The degree to which the style of the small picture approaches that of the Dei Altarpiece suggests that it was executed in Florence almost immediately upon Rosso’s return to his native city. The subject of the picture almost certainly implies that it was done in Florence which Rosso seems to have left to serve the Lord of Piombino in 1519 and to which he returned only after executing the two altarpieces dated 1521 in Volterra and originally in Villamagna.